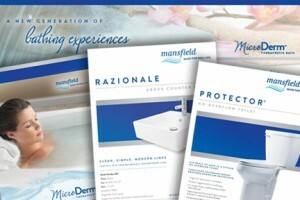 If you’re a Mansfield customer, you know that one of the key benefits of selling our products is you get the full support of our marketing efforts — including materials you can use to sell our toilets, tubs and sinks. Visit the Resources page on our website to download more than two dozen sell sheets, brochures and fliers. These can be used as training tools internally for your team and to share with your customers. You can also pull information from these pieces to use on your company’s website and social media pages. At Mansfield, we also offer a GMROI calculator, installation tips and videos, CAD details and point-of-purchase merchandising materials to support your selling efforts. Many of these are available on our website in the Resources section, or through your Mansfield representative.